« Happy Belated Birthday Robert Ramirez! 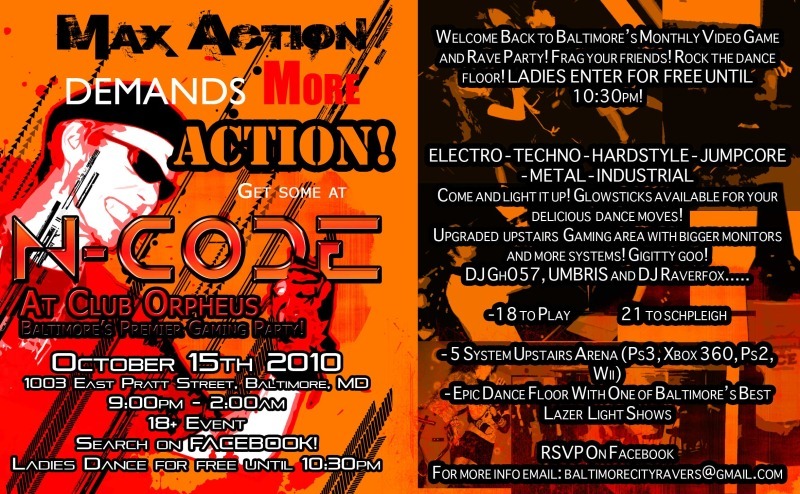 This Friday Max Action will once again be bringing the ACTION back to N-Code! OR IF YOU’RE A REAL MAN OF ACTION follow Max around the dance floor and publically declare “I CHALLENGE YOU TO MORTAL KOMBAT!” so that the whole world knows YOU HAD THE BALLS to dare challenge MAX ACTION. N-Code is back…IN ACTION! With Max Action! He is a man of ACTION and he is coming to make you man and or women of ACTION! Come on out and party hardy to mad rave beats from DJ GH057, DJ RAVERFOX and UMBRIS as you wage war in our upstairs gaming arena! As always, any lovely gamer ladies are welcome to dance and play for free until 10:30pm. The gaming tournaments WILL RESUME, headed by none-other than Max Action himself! We are an 18+ Event. You must be 21+ to drink. You must be this tall to ride the rollercoaster. (?) Quick details for N-Code n00bs below.